Princess Windy City & the Tale of the Superfluous Sparkle Skirt | Sew Lindsay, Sew! 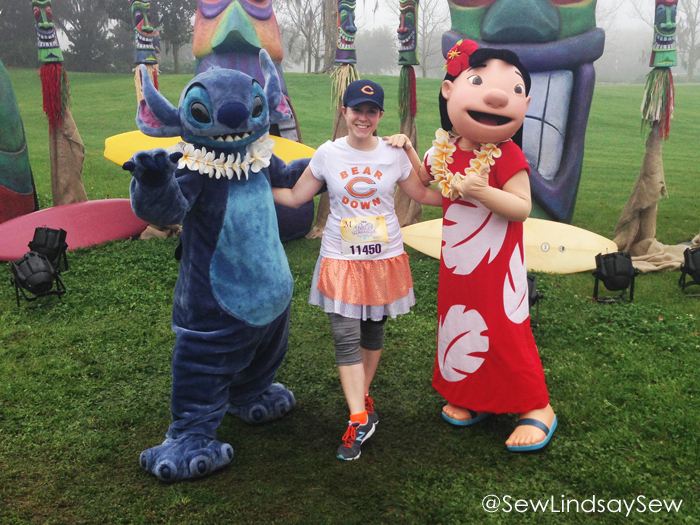 Last weekend, I ran the 2014 Disney Princess Half Marathon! Roadside distractions! Aladdin, Flynn Rider and Prince Eric. Years ago, one of my roommates ran Disney’s (now defunct) Race for the Taste, and when I saw her cross the finish line, I was inspired to start running just so that I could experience a Disney race for myself. Since then, I’ve participated in a variety of races… 5Ks, 10Ks, half-marathons, corporate races, mud pit races, “distance dare” events (two races in one day), races where they fling colored powder at you, races that end with a spin on Expedition Everest… the list goes on. Throwback photo! Back in 2008, getting ready to run (and bike) in the Muddy Buddy race with my roommate Tracy – the roommate who inspired me to run in the first place! 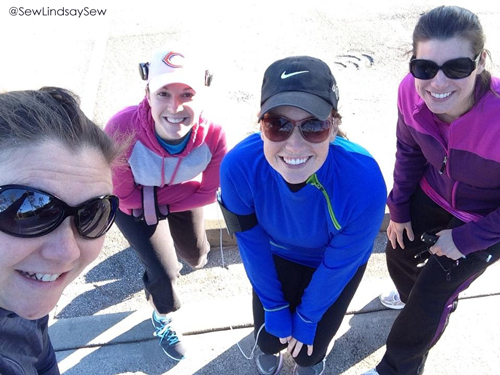 This past summer, a friend from work organized a casual running group in preparation for the Princess Half. I had just finished grad school, so it was perfect timing to get back into running! Since then, we’ve had a standing meeting on Sunday mornings to run together. A few of us on a Sunday run about a month ago! Kind of weird to see us Florida folk in cold weather gear, right!? One highlight of Disney races is the costumes that participants wear during the races. All of those tutus sure makes the long distance runs more entertaining to watch! But, instead of dressing like Disney princesses, our group decided to dress as “princesses” representing our hometowns. I decided to go with a Chicago Bears theme! 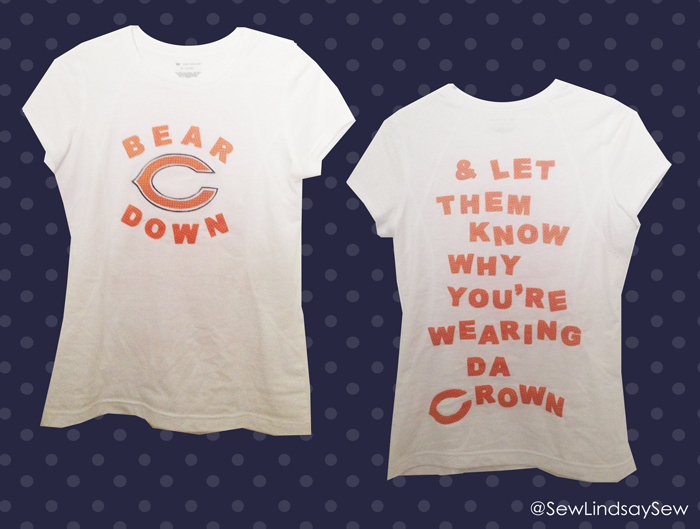 Have you ever met a Chicago Bears princess? Yeah, me neither. So I had to create her from scratch! 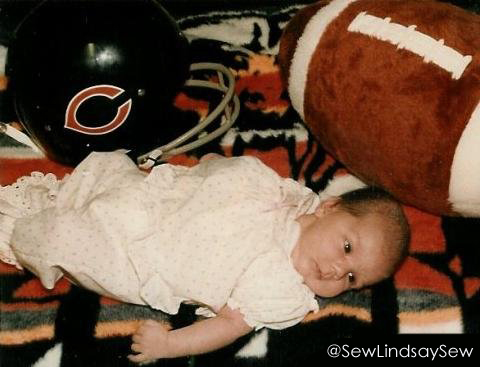 Throwback photo from my baby days – my family really loves the Bears! 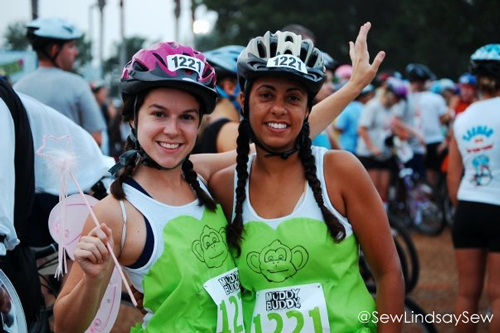 In the running world, sparkly skirts seem to be the “in” thing for race costumes. But I wanted to sew my own, and I even found a few blog tutorials. It sounded like some girls in the blogosphere had even attempted sparkle skirts as their first sewing project ever. At this point, I consider myself an “advanced beginner” when it comes to sewing, so how hard could it be? Well, let’s just say I’d rather run another half-marathon than attempt to sew a sparkle skirt ever again. Well, you know that scene in the original Parent Trap movie, where Susan cuts out the back of Sharon’s dress? Yeah – it was like that! Um, I’m not running in that! But, no worries, this is a Disney story, and all Disney stories have fairytale endings! I bought a silver skirt from Sparkle Skirts at the Disney Princess Half Marathon weekend expo and used some orange fabric remnants to create what I call a “sparkle apron.” Basically, just a small, ruffled panel with straps across the top that tied in a bow in the back. My skirt had a two-color, layered effect and I didn’t feel as guilty for investing in the orange fabric. Deciding to applique ALL of those shapes onto the shirt was quite a commitment, and a painstaking process. I don’t have a fancy die-cut machine, so I had to cut them all out by hand. But I really dig quality crafting, so I couldn’t stomach the idea of using things like Sharpies or puffy paint for this shirt. If I’m going to invest the time, I’d like for the end result to last so that I can wear it again and again. Especially a shirt as awesome as this one! I’ll definitely be wearing this shirt on football Sundays next fall. 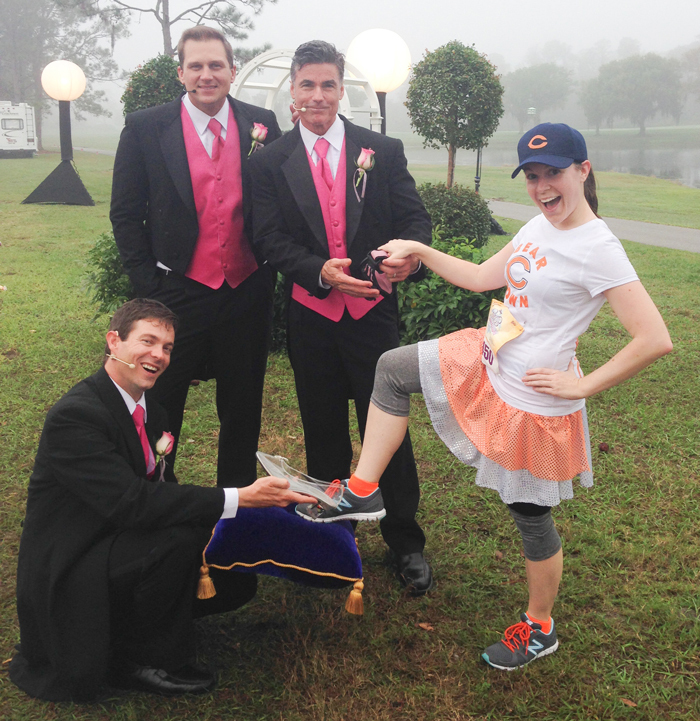 I threw a Chicago Bears hat, orange socks and orange shoelaces into the mix for good measure. In the end, the costume was a success – and so was the race. Simultaneously the most awkward and most awesome photo ever. 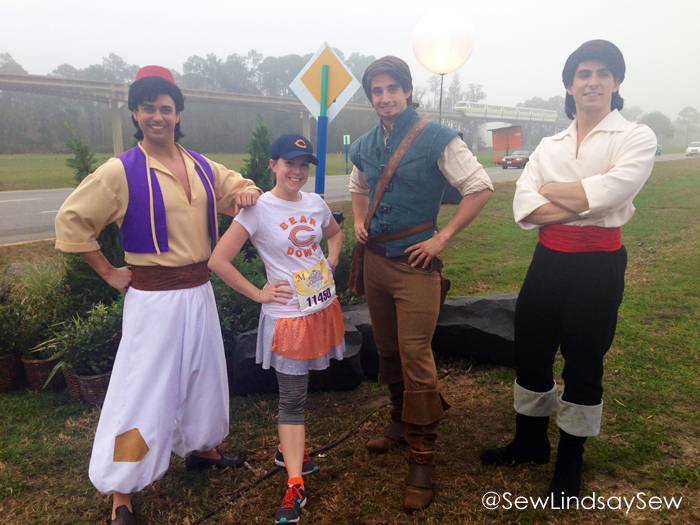 If you ever have a chance to run a Disney race – I would highly recommend it! LOVE it! I’m looking up the race right now for next year! 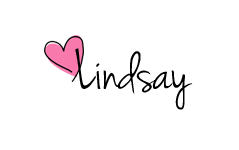 Pingback: Sweet Success | Sew Lindsay, Sew! Pingback: How to start a new hobby (without going broke) | Sew Lindsay, Sew!